The German cockroach is one of the most common cockroaches. They are light brown to tan with two dark lines that are found on the pronotal shield, found behind the head. The female is darker than the male and a little bit broader. Development time for this cockroach is 54 to 215 days, depending on the environment. The ootheca, an egg capsule, is yellowish brown. The female carries the oothecae with her, which average 30 to 40 eggs each, until 1 to 2 days before the eggs hatch. Adults live from 100 to 200 days on the average. The German cockroach shows preference for warm and humid places like kitchens and bathrooms. Any crack and crevice near water or food sources are a natural place for them to be found. The cockroach is introduced into buildings by paper products or packaging such as cardboard boxes or bags along with secondhand appliances. They will feed on most any type of food. The Brown banded cockroach is named after its physical characteristic of the pale-brown band which run across the wings of the adult and from the bands which run across the body of the nymph. 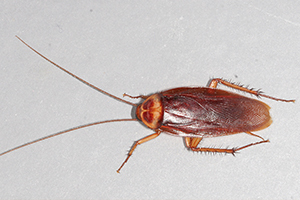 The color of this cockroach is a brown to light brown with the females being darker than the male. The head is a dark brown and the wings are darker at the base and become paler at the tips. The female wings do not completely cover the abdomen as they do with the male. The ootheca, an egg capsule, is light brown that has 8 to 10 sub segments. The female will carry the ootheca for 24 to 36 hours and then attach it to the side or underside of furniture. The female will produce, on the average, 14 egg capsules with each containing around 16 eggs. The developmental stage takes 90 to 276 days depending on the environment. Adults live about 206 days. The brown-banded cockroach has a preference for warmer areas and can be found in high places such as picture frames, wall molding and on the ceiling. They are also found near appliance motors, in light switches, closets and furniture. 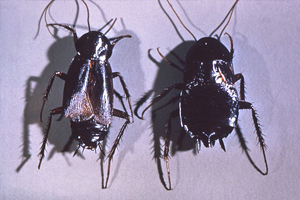 The Oriental cockroach is thought to be of North African origin. 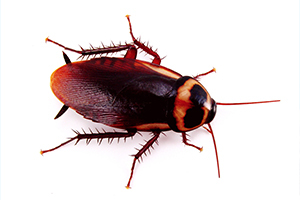 The color for this cockroach is usually a shiny black but also may vary to dark reddish-brown. The male wings cover 75% of the body whereas the female’s wings are much shorter, stubby wings. The adults do not fly. The ootheca, an egg capsule, is reddish brown when laid and then turns black. The female will place the ootheca within 30 hours after it being formed. They are dropped or glued to something warm and protective and near a food source. The female produces 8 oothecae containing about 14 eggs. The developmental stage takes 300 to 800 days on the average and can be influenced by the environment. The female lives 34 to 181 days whereas the male will live 112 to 160 days. The Oriental cockroach survives outdoors quite easily. They are found in wall and porch voids, under debris, stones, and leaves. They feed on all kinds of food as well as decaying matter but prefer starchy foods. The American cockroach is not native to North America but was probably introduced by ships from Africa. The color of the American cockroach is reddish-brown except for a pale-brown to yellowish band around the pronotal shield, found behind the head. Both male and female are fully winged. The male’s wings extend past the tip of the abdomen whereas the female’s wings do not. The American cockroach can fly. The ootheca, also known as the egg capsule, is dark reddish- to blackish-brown. The female will deposit her ootheca within a few hours to 4 days after it is formed. It is glued by mouth secretion to a suitable surface, usually in a safe place of somewhat high humidity near a food source. The female produces 9 to 10 oothecae, which contain about 16 eggs each. The developmental stage is varied by the environment and usually takes from 285 to 616 days. Adult females live about 225 to 440 days depending on the environment; the male lives about 200 days. 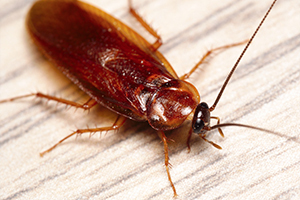 The American cockroach is quite common in large commercial buildings like restaurants and grocery stores where there is food storage. In the United States, this is the most common found in the city sewer systems. The wood-roach is chestnut brown in color with pronotal shield, found behind the head, and forewings edged in white. The male is fully winged and a good flier whereas the female’s wings are smaller, covering about half of the abdomen. The ootheca, an egg capsule, is yellowish brown. The female will deposit the ootheca under loose bark of dead trees, stumps, fallen logs and other protected areas of that nature. The female produces about 30 oothecae each containing up to 32 eggs. The developmental time usually takes about a year but can take two years. 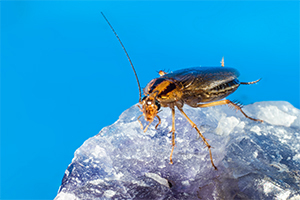 The Wood roach is typically an outdoor species found in the same locations that the oothecae are laid at. They have also been found in cedar-shake shingles, siding and gutters. If found inside, it is likely they were brought in. They rarely breed or survive indoors. Males are usually inactive during the day but can be found flying around lights at night. The Wood-roach is known to prefer sweets as its food source.